Four score and seven years ago, our fathers brought forth on this continent a new nation, conceived in Liberty, and dedicated to the proposition that all men are created equal. 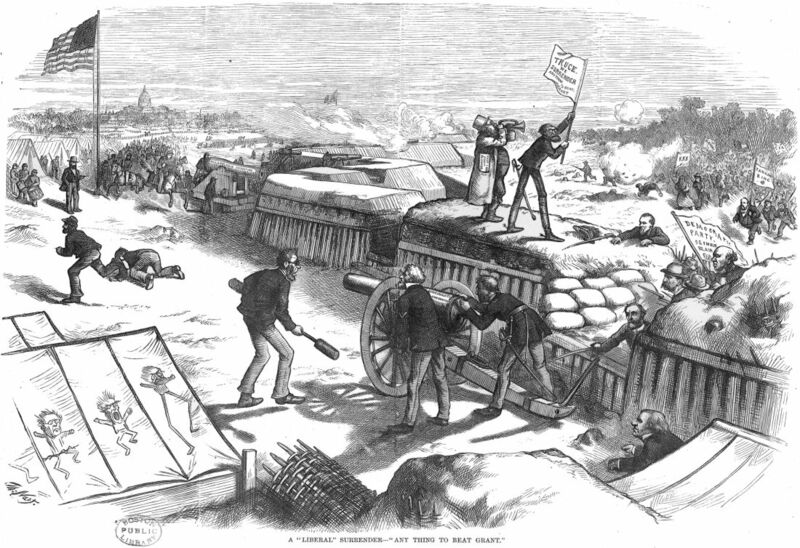 Now we are engaged in a great civil war, testing whether that nation, or any nation, so conceived and so dedicated, can long endure. We are met on a great battle-field of that war. We have come to dedicate a portion of that field, as a final resting place for those who here gave their lives that that nation might live. The world will little note, nor long remember what we say here, but it can never forget what they did here. It is for us the living, rather, to be dedicated here to the unfinished work which they who fought here have thus far so nobly advanced. It seems appropriate for veteran’s day this year. However, that’s not why I’m posting it. I chose it because it was a short text that many people are familiar with. It’s also a relatively non-controversial text, unlike the bill of rights that I used to use as an HTML exercise back in the days when people created HTML by hand. Those of you who have read It Isn’t Murder If They’re Yankees have seen the conversation that ensued. In my case, however, I wasn’t fired, though I continued to use it. The cheek of every American must tingle with shame as he reads the silly, flat and dishwatery utterances of the man who has to be pointed out to intelligent foreigners as the President of the United States. We pass over the silly remarks of the President; for the credit of the Nation we are willing that the veil of oblivion shall be dropped over them and that they shall no more be repeated or thought of. It’s amazing what you hear when you listen through a haze of unreasoning partisanship. Or Trump—the lyrics may change, but the tune remains the same. There is a theory that beltway Democrats and Republicans are not opposed to each other, that they merely delegate issues to continually fail on. Failure theater. That is, they pretend to oppose something but mean to fail. Syria calls that to mind now. Democrats, it turns out, actually want troops in Syria; they were opposing it merely for failure theater. When President Trump decided that our mission in Syria was finished, they were forced into showing their true position. In that theory, it doesn't matter that Trump is a Republican, or that they hate him. They’d be flip-flopping even if, say, President Obama had chosen to pull out of Syria. The other theory, of course, is that Democrats reflexively oppose whatever Trump does. They call for the firing of Comey; Trump fires him, they oppose the firing of Comey. They call for leaving Syria, Trump announces we’re leaving Syria, and they don’t call it a win for their policy, they pivot to opposing leaving Syria. They call for border walls, Trump campaigns and wins on border walls, they don’t call it a win, they oppose border walls. Up until now, I've thought that the latter theory explains the Democrats flip-flopping better and that the former is conspiracy-theory territory. But their turn-around on Syria makes it much more believable. Most people, Democrats or Republicans, don't really care one way or another who runs the FBI or whether we have drones killing terrorists in the Middle East. But a lot of people who vote Democrat do care about whether we are engaged in foreign wars. Opposition to war overseas, especially in the Middle East, is one of the their base’s defining stances. It reminds me a little of Lincoln's story about Illinois Democrats changing their principles based on the word from the national party. They’d been going along with the old Missouri Compromise, limiting slavery to states where it already existed. Then national Democrats sent them word that their policy had changed, and slavery should be expanded into the Nebraska territories. This election is exactly 158 years from Abraham Lincoln’s election as United States President—on November 6, 1860. Sometimes it seems as though our United States are as disunited now as they were then. I’ve been slowly reading through Abraham Lincoln’s letters and speeches, and one of the really striking things about them is how durable the basic tenets of conservative political thought have been. The right of people to be just left alone whether you agree with them or not; the necessity of equality under the law; the right each individual has to the fruits of their own labor. This would not have been called conservative at the time, as the labels we apply to political movements have changed since then. But they are clearly the conservative philosophy as we now understand it, and were the bedrock of Lincoln’s political philosophy. Just as striking is how alien these principles were to the enemies of conservative thought, to the beltway class. If you thought slavery was wrong, you believed in setting the slave over the non-slave. If you disagreed that slavery should spread, your disagreement was the same as—or worse than—violence. And if you believed that everyone had the right to the fruits of their own labor, you were a hypocrite who believed that the national government should regulate everything from cranberries in Maine to oysters in Virginia. There was no sane common ground with the Democrat’s leadership then just as there isn’t now. If you’re not for banning effective self-defense, they say, you’re for blood in the streets. If you’re not for government control over health care and doctors, you’re for bodies piling up in inner cities. There is no understanding of the universal benefits of a democratic republic, of letting people buy, sell, and work the way they want, of ensuring that the law is simple, understandable, and evenly applied, of just letting people be. Equality of opportunity, as we call it today, simply didn’t register with the Democrat leadership then any better than it registers with them today. 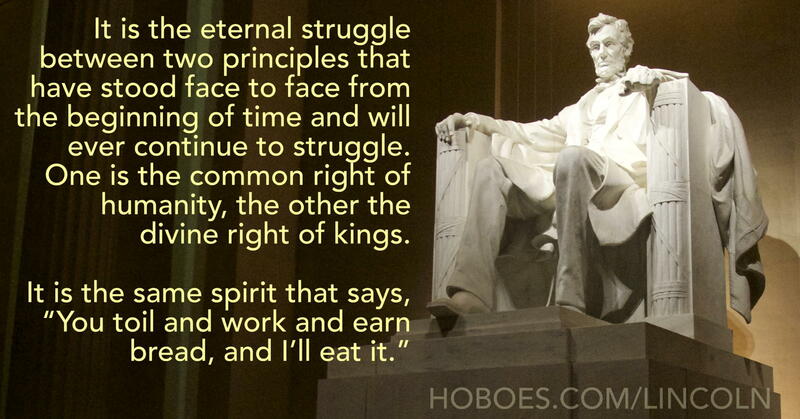 As soon as Lincoln talked about equality of opportunity, Douglas heard equality of outcome. 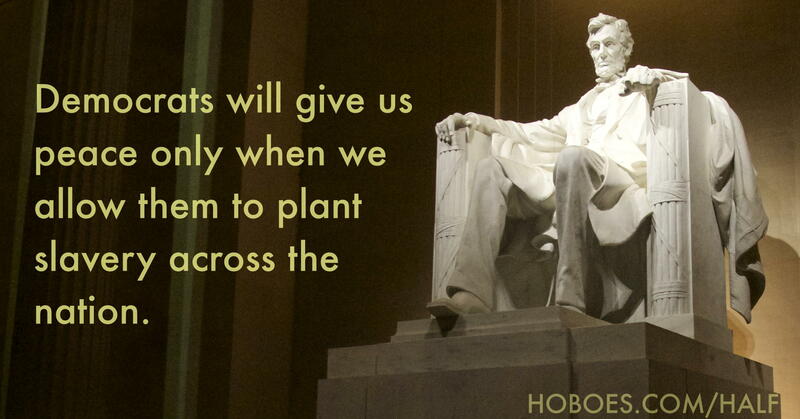 Equality of opportunity was so alien, then as now, that they simply couldn’t understand what Lincoln was saying. I’m pretty sure this has not been the case uninterrupted between then and now. I’m pretty sure JFK, for example, was neither a Stephen Douglas nor an Elizabeth Warren. Lincoln’s Rejoinder in the Fourth Joint Debate at Charleston, Illinois, September 18, 1858. Following the election of a “coarse”, “vulgar clown” of a Republican, “a man of no intelligence”, to the presidency, establishment politicians got together in Washington to save the policies he threatened to destroy. Republicans were begged by a tearful resistance—and establishment—to betray the extremists who elected them. Many Republicans listened more to the establishment than to the voters who elected them. Republicans loyal to the President feared—and Democrats and establishment Republicans hoped—that the electoral college would interfere and block this radical “ignoramus” from the White House. “Wise statesmen” reminded the Republican president-elect that he had been elected without a majority of votes cast and implored him to maintain the policies of his Democrat predecessor. Mobs ruled the streets protesting the election. The country was as literally divided as it could ever be. A four-volume work by Carl Sandburg covering Lincoln’s presidency in detail. Why do gun owners think the left wants to take our guns? Gun owners think the left wants to take away guns because the left keeps refusing commonsense gun laws in favor of laws that ban guns. The left has once again decided that the way those people speak is ignorant, and that those people are too stupid to hold public office. Because you keep trying to tell everyone else what to do. It’s a hypocritical form of divisiveness, calling for togetherness and reason whenever your side commits a crime, and engaging in unreasoning partisanship when you can find some way to pin it on others. Why now for the alt-right? Why are people attracted to bullying movements today, when they weren’t yesterday? Because they see that bullying works. Embarrassed by our president last modified February 2nd, 2019.